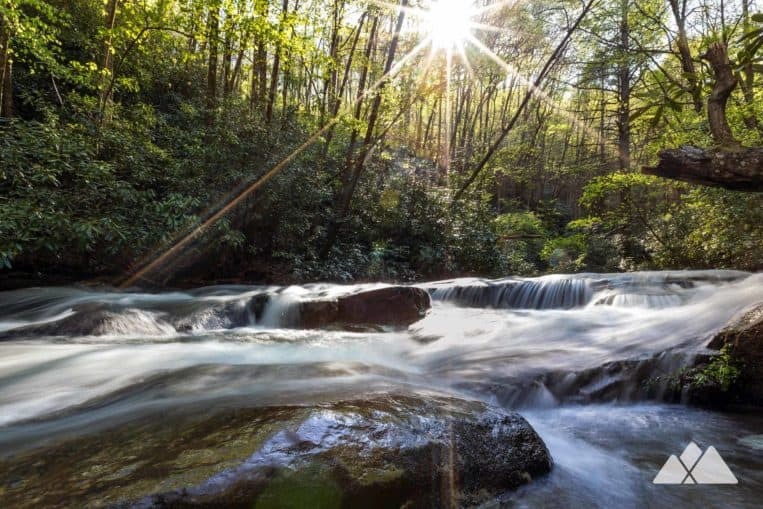 This hike’s main highlight is outstandingly beautiful: at the trail’s end, Hemlock Falls cascades over a sheer cliff, tumbling in tendrils of whitewater into a clear, cool pool below. 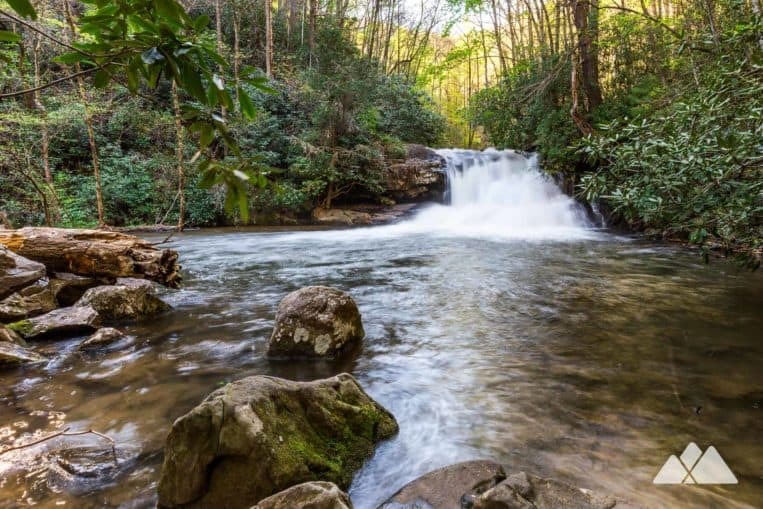 To reach the waterfall, this hike follows Moccasin Creek upstream from Lake Burton, catching beautiful views throughout its one-mile length. After plunging over this hike’s main attraction, the creek tumbles through a rocky, boulder-filled valley, cascading in many smaller waterfalls, framed by a lush, green forest. If you’re a fan of hiking to Georgia’s waterfalls, then this is a must-hike adventure. And its relatively short length makes it kid-friendly, too, for trail-savvy families. 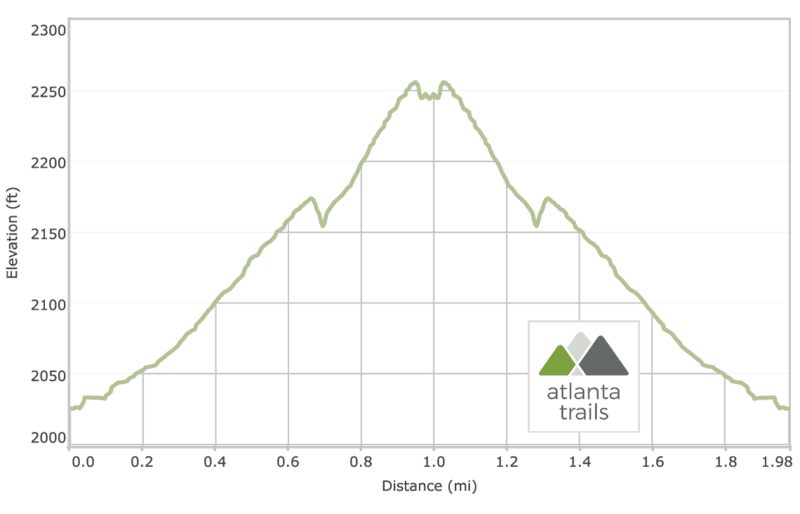 The trail departs from Lake Burton’s western shore (view maps and driving directions) near the entrance to Moccasin Creek State Park. The trailhead is reached via a gravel road and is marked by a huge, inscribed boulder at the trail’s start. On the trail’s right side, the creek loudly roars as it cascades over its rocky, boulder-filled creek bed. The trail passes a campsite at .2 mile, steadily gaining elevation to climb a ridge high above the creek. The trail reaches a cave and a small bench at .45 mile. 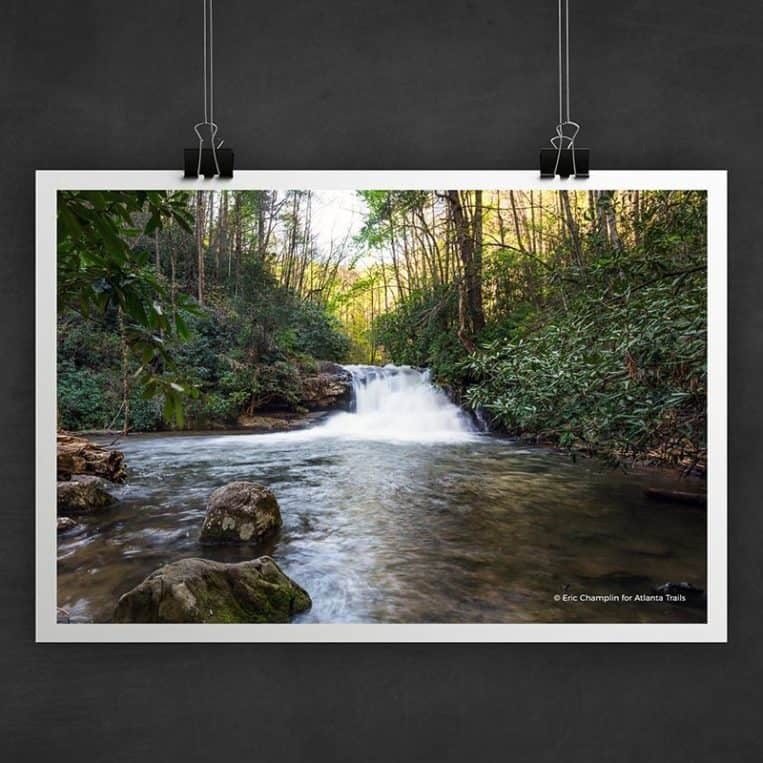 A look across the creek from the bench, especially during rainy Spring months, catches views of a small, ribbon-like waterfall plunging from a high-elevation cliff above Moccasin Creek. 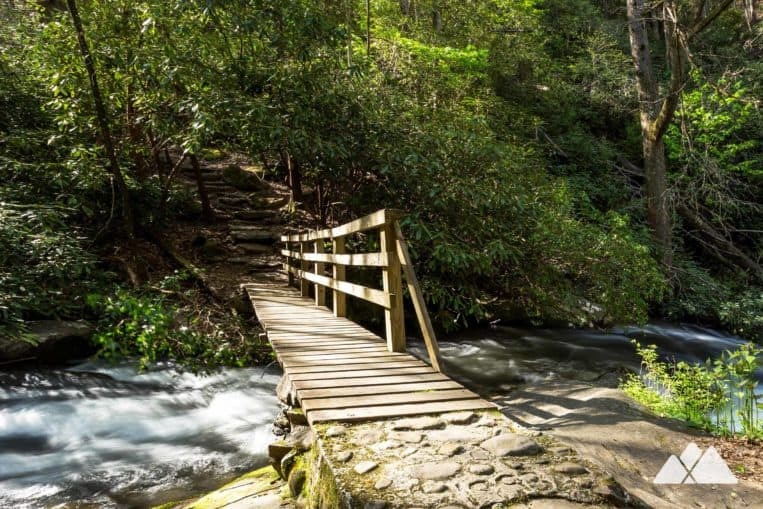 The trail dips elevation to cross a wooden bridge spanning Moccasin Creek at .7 mile, carefully hiking across the rustic bridge. Rising from the creek, the trail climbs a set of stone stairs, resuming the elevation climb. The roar of the nearby waterfall amplifies through the forest, growing louder as the trail approaches. The hike reaches a clearing at 1 mile. Hemlock Falls plummets from a broad, rocky cliff into a calm pool below, framed by tumbled boulders and gnarly-trunked rhododendron. The sandy beach below the waterfall is a great spot to take a water break, grab a snack or relax in the dappled sunshine streaming through the forest while enjoying the waterfall’s sights and sounds. Departing the waterfall, the hike doubles back on its outbound route, following Moccasin Creek downstream. 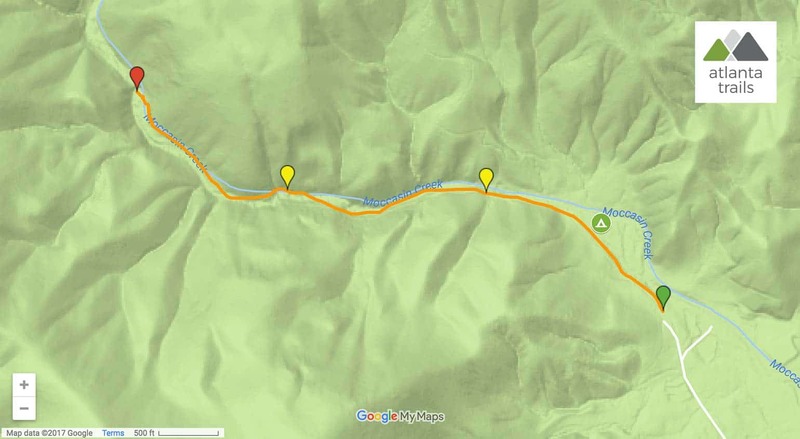 The hike reaches the trailhead at 2 miles, completing the adventure.